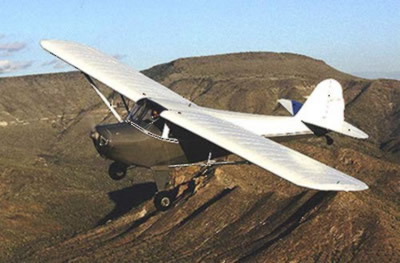 You can almost guess how long an individual has been aware of classics of the late 1940's by the amount of awe in his or her voice when seeing a pristine, restored BC-12 Taylorcraft. The reason for that is the image many carry in their minds of a Taylorcraft is of it sitting lop sided on the back tie down line, one tire flat, a bird-nest apartment in the cowling and mice running up and down inside the rotting fabric. 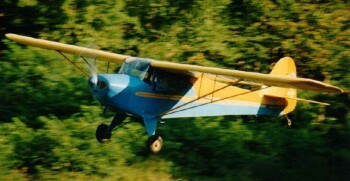 Cubs and Champs never slid down hill as quickly as did the Taylorcraft breed. Even though every pilot on the airport recognized that Taylorcrafts were far faster than the rest of the 65 hp group (with the possible exception of 8A Luscombes), the airport hobo was most likely to be a Taylorcraft. There's no good explanation for the Taylorcrafts past image except that there were just so many of them around, some were bound to go down hill. Although never produced in the same numbers as the Cub, as soon as old C. G. Taylor introduced his side by side Model A in 1937, the market forced him to crank them out like cookies. It wasn't unusual for the factory to be doing 30 airplanes a month in 1938 before the depression had even wound down. The Model A's had the less then overwhelming A-40 Continental, but it performed so well, every one loved them. Then came the first of the overhead valve Continentals, the A-50 (Taylorcraft Model BC) and then a shining knight came riding over the horizon in the form of the Continental A-65. The A-65, more any other single technological event, made the Taylorcraft and every other of its peer group take a giant step forward. What had been a good airplane became astoundingly good. C. G. Taylor had an eye for building clean, low drag airframes. He got his lift from lots of wing and his speed from low drag. On the same engine with which a Cub could barely make 80 mph, the BC-12 series was easily doing 95 mph and some would touch 100 mph. Taylor built thousands of airplanes before the war shut him down to start making L-2's. After the war, they cleaned up the airplanes still further and introduced the BC-12D. There are probably more of this model existing than any other. By the same token, more BC-12D's died on back tie-down lines than any other given type. Go figure! Considering that it was built to beat the Cub and humiliate C. G. Taylor's late business partner, William Piper, there's very little Cub in a Taylorcraft BC. In fact, he did everything he could to do it different and do it better. The side-by-side seating was a major departure, as were the novel, for the time, control wheels sticking out of the panel. Boarding was via an automotive type door on the right side. Eventually, another door on the other side was offered and became standard in later postwar airplanes. The wing's airfoil, rather than being the flat bottom Clark "Y" or USA 35 everyone else was using, was a semi-symmetrical 23000 series known for low drag and less gentle stall characteristics. For a wing that long to be that fast with such a small number of ponies available, it had to have a low-drag airfoil. The pre-war airplanes used 1025 steel tube or a combination of 1025 and 4130. Postwar airplanes are all 4130. All of them have to be inspected carefully for rust, if nothing else because they are so old and most sat out for so long. The wings use pressed-aluminium ribs over wooden spars which also need careful inspecting. Besides age, a surprising number of the aircraft have been ground looped at least once and the incident may or may not be in their log books. The wings have a lot of overhang past the strut attach points and they could easily have spar cracks which don't show except under careful inspection. Most Taylorcrafts use Shinn brakes which are mechanical shoe types with the lining on the drums, not the shoes. Considering that the airplane really doesn't need brakes most of the time, the brakes work just fine. Their cams can wear, but the units are easier to repair than most of the period. 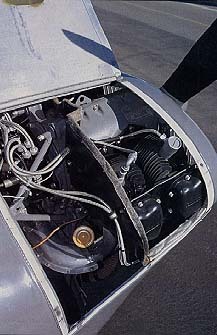 The A-65 Continental engine is the standard by which all small reciprocating engines are measured. It's reliable, user friendly and easy to maintain. Parts are still available and overhauls still relatively inexpensive, when measured against more modern engines. If the mag coils are good and the timing is remotely right, the engines will catch on the first or second blade every time. We prevailed on Gary Towner, an FAA airline maintenance inspector in Phoenix, to let us use his freshly restored BC-12D as the test vehicle to remind us how a T-craft flies. Towner says when he bought his Taylorcraft, it was a flying airplane but in need of complete restoration. In the course of taking it apart he found the spars were riddled with cracks. As he put it, "...they were really scary looking." He feels all owners of aircraft that old should take note of his experience in that area. His airplane was, as near as he can determine, originally a BC-12D-1, which he says was the bottom line, low-buck airplane that didn't even have a left door. The second door was added sometime in the 1970's by a previous owner. As with most two-place, side by side airplanes of the era, getting in is as much a project as flying it. In the T-craft it is made more difficult by a diagonal brace running across the end of the seat. Once loaded up, Gary and I were, shall we say, "cozy." Our shoulders were definitely touching part of the time. 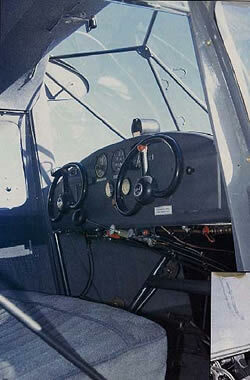 We didn't measure the cockpit, but it is probably several inches narrower than a C-150/152. Visibility over the nose, however, was good without even stretching. This was important because the headliner was nearly touching my head and I would have touched it if I had to stretch. 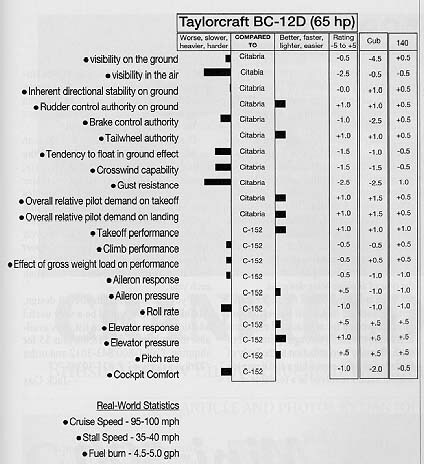 Part of the Taylorcraft's speed comes from having low frontal area and this means a low cabin. It is low enough, in fact, that turning your head sideways puts your eyes right in the middle of the wing root. To see to the side requires ducking down quite a bit. This is more of an aggravation than a danger, but the lack of visibility is something to be remembered at all times. The big control wheels are fun and the brake pedals are funny. They are two tiny, thumb sized pedals located well back and right between the rudder pedals. They are nearly touching one another. Fortunately, they are used very little in normal flight. Taxiing is straight forward with the only complication being having to look down to dial frequencies into the handheld radio mounted between us on the front seat edge. That location keeps the cockpit looking absolutely original. I hadn't been in a Taylorcraft in years and my primary memory was one of the airplane flying as if it was very light. Gary's airplane re-enforced that memory. As soon as the power was up, the airplane wanted to fly and I barely had the tail up before it floated off. The tail is so far behind us, it has lots of authority so very little rudder movement was needed to keep it straight. We had barely a breath of wind, maybe two or three knots, across the runway. Most airplanes wouldn't have even noticed that wind, but the second we left the ground, the Taylorcraft instantly reacted to the wind by drifting. I found myself crabbing into a wind the windsock barely recognized as being there. The airplane has a definite thistle down feeling to it and wind is a challenge to it. The best pilot on any airport is the Taylorcraft pilot who easily and routinely conquers a gusty crosswind. With firm hands, the airplane will handle more crosswind than is prudent, but most folks study the windsock carefully before pulling the airplane out. With such a light wing loading and those long wings, it's second cousin to a parachute. It was fairly cool out, about 70°, and the airplane responded by giving us a fairly solid rate of climb in the 400-500 fpm range at about 65-70 mph. Gary says he gets about half that during the summer and prefers to fly the airplane solo in those situations. The air was liquid smooth so we didn't have much turbulence to show the Taylorcraft's cork-like ability to ride over even the softest bump. We also didn't have any thermals to help us to altitude. More than any of its peers, the Taylorcraft is eager to lock on to even the weakest thermal and convert it into altitude. As we levelled off, the airspeed stabilized at 90-95 mph and Gary says he can flight plan 95-100 mph and be fairly close. He's generally burning around 4.5 gallons per hour and, considering his airplane has both wing tank options as well as the fuselage tank, the airplane will stay in the air far longer than he can. The ability to go long distances in a reasonable time on pennies has always the Taylorcraft's long suit. Because Gary had gone completely through the control system, including installing ball bearing pulleys, his controls were surprisingly smooth. There was none of the common feeling that a cable was sawing a pulley in half. Also, when racking the ailerons around, the airplane was quite willing to respond. We're not talking Pitts Special roll rates here, but even with those long wings, it rolled faster than most of its peers. Adverse yaw is significant, but not as much as a Champ and about the same as a Cub. The amount of rudder required to coordinate is minimal, but definitely there. In checking pitch stability, it damped out completely in less than three cycles when pulled ten mph off trim speed. Doing stalls was, as is usually the case with this period of airplane, almost a waste of time because they are so benign. In a normal, slow approach to a stall, the wheel hit the stop somewhere in the low 40 mph range and the airplane just mushed. If accelerated, either in a turn or straight, it would break slightly and then mush. During the process I was careful to keep the ball centred because the rudder is very effective at those slow speeds. As I remember, if asked, the airplane spins very nicely and willingly, with a positive recovery. There's no doubt you're in a fairly small cabin, when cruising. Even though you can see over the nose quite well, your eyes are closer to the thrust line than we're used to so the visual down angle is pretty flat. Also, the necessity to duck to see sideways is always there. The overall feeling is one of being in a long, narrow cabin, when really it's the vertical height that gives that illusion. Skylights would probably open up the cabin feeling considerably. When we came back into the pattern, I reminded myself that this airplane would really glide, so I spaced us out accordingly on base. Even so, I was too high. Fortunately, the airplane is a good slipping machine. Not as good as a Cub, but still good. Gary said he uses 70 mph, so I did too, which seemed to work out fine. As I came out of the slip and into ground effect, the Taylorcraft's reputation as a floater was again re-enforced. We may have been a little fast, but, as we floated along while I felt for the ground, I was very conscious of having to be very judicious with what I did with the elevators. Just the slightest amount of too much back pressure and the airplane would try to balloon. Since we were slowing to a near-walk this was more of a game, than anything else. The airplane clearly telegraphed when it was about to settle or balloon and I just had to adjust accordingly. After a few seconds of floating, it would give up and settle on to the ground. On one, I held it off just a little too long and felt it unhook and drop us the last several inches. That surprised me, but shows it's not a good idea to hang it on top of ground effect for too long. All of the landings were three-pointers, some better than others, and none were even remotely challenging during roll-out. The airplane didn't want to do anything unusual and was at least as easy as a Champ or Cub to control. The wind had pretty much died down, so we had the best of all possible situations going for us. The T-craft is actually quite a good bargain, even in this period of rapidly inflating classic airplane prices. A quick perusal of Trade-a-Plane showed that even the restored airplanes seldom touched $20,000 with many restored ones with low-time engines at $15,000 and below. Un-restored airplanes were in the $10,000-$12,000 range. When buying an un-restored airplane, however, inspect it very carefully. At sometime in its life, it was doing duty as shelter for all types of mice and varmints. When buying a newly recovered airplane, make certain all the rust and rot problems were attended to.